Ever since the first footage of Infinity War emerged, fans have wondered what the giant circular object in the sky over New York is. Peter Parker looks up and sees it, making his Spidey Sense tingle, letting us know that Thanos has arrived on Earth. However, until now, nobody knew what that circular ship was called. A new report states that the official name of Thanos' circular vehicle is the Q-Ship. 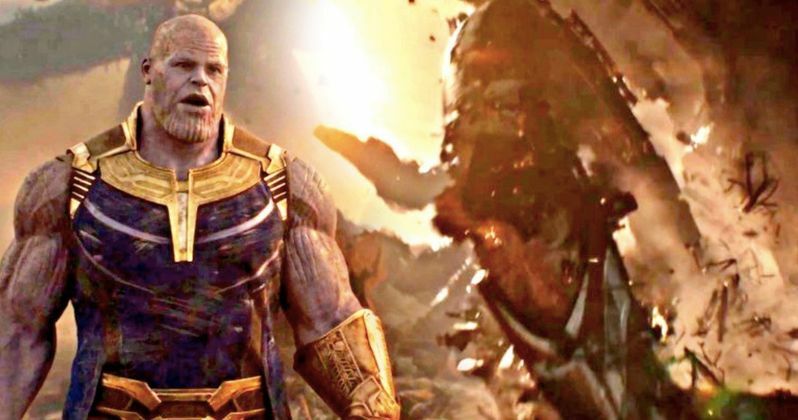 The information about Thanos' ship comes to us from Entertainment Weekly, but they don't offer up any other information about the ship. It's obviously circular, which makes sense to call it a Q-Ship off of the shape alone, but the Q part isn't automatically evident. There could be some kind of ramp or weapon that sticks out, giving it a Q-like shape, or we could just be reading too far into its shape. Whatever the case may be, we finally have a name for the giant circle that we've seen Spider-Man landing on in the Infinity War trailer. The Q-Ship isn't just carrying Thanos. The circular vehicle also contains his evil Black Order who are on the hunt for the Infinity Stones. By the time they land in New York, the villainous "family" already has the Power Stone and the Space Stone, giving a significant advantage over the Avengers. It's been speculated that the Black Order will be sent to locate Doctor Strange since he knows of the location of all of the Infinity Stones, which has been hinted to in the new trailer, which finds its source from the 2013 Infinity comic series. There's a lot to take in while watching the newest trailer for Infinity War, but it obvious that there is a dark undertone to the whole preview. Looking at Tony Stark in busted armor with Thanos ready to pounce isn't a pretty sight and either is the struggle between Captain America and Thanos in another scene. It's safe to say that Thor makes it out of his run-in with the Mad Titan, but for the other two, and even Doctor Strange, the future might be pretty bleak. It's already been teased by the Russo Brothers that not everybody will make it out alive after the dust settles, and a few of the aforementioned characters may fight their final battles in Infinity War. Even with the new Infinity War trailer, there's still a lot that is unclear at the moment, which is a good thing. Pre-sale tickets are already on sale and they have officially broken the all-time record for a superhero movie in less than 8 hours. Marvel fans want to go in blind and see what the Russo Brothers have pulled from the Marvel Comics source material to make something brand-new. You can head over to Entertainment Weekly for the original report about Thanos' circular Q-Ship.